Cooled by soft Gulf breezes and washed by the blue-green waves, enjoy sun-denched days and star sparkeled evenings. 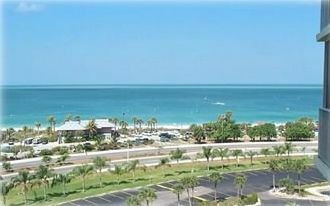 We promise panoramic views of the sparkling Gulf of Mexico from this eighth floor, cozy efficiency condo in this friendly resort in Bonita Beach. The condo is located in the Beach and Tennis Club, just a few miles North of Naples and just a 10 minute drive from Fort Myers Beach. Bask in the Florida sunshine on your own balcony and watch fabulous sunsets every night. Swim in the two heated pools, join the tennis program on clay courts on site or stroll or relax on the beach. The pleasures of this beautiful coast are without comparison. Golfing, fishing, pleasure boating, tennis and shopping are some of the activities readily available, as well as swimming and shelling along the coastline. Enjoy endless walks on the beach and collect shells as many as you want! You will be on the beach in a just 2 minute walk without having to look for paid parking spaces at a beach access. Enjoy your vacation in this clean, cozy and comfortable condo. We have put a lot of love and tender care into our second home. HOME IS WHERE THE BEACH IS!!!! We are a small family with a 12 year old daughter and we consider our condo as our second home. Here we can escape from the 'real world'. We prefer quiet vacations in a friendly surrounding. We love to walk endlessly on the beach without losing time by looking for parking spaces. We just love to watch the dolphins play and we are always excited to see some turtles taking a walk on the beach. Nothing can compare to the stunning sunsets from our lanai. We enjoy to be near the Ocean and to watch dolphins play in the Gulf of Mexico. The view always takes our breath away!!! The only 'obstacle' is a road to cross. No buildings are blocking the perfect view on the beach. The only 'obstacle' is a road to cross. No buildings are blocking the perfect view on the Gulf of Mexico. As of May 2018 the Internet usage is included in the rental Price. There are 2 heated pools to use for renters and a Baby pool also. One pool has a ramp for wheelchairs. The unit is as depicted. Very comfortable and has the necessary items for a stay. Easy check in /out procedures. Would recommend to anyone looking for a great place to stay in the area. Easy access to the beach and restaurant across the street. Nice screened balcony has ocean view and perfect for morning coffee. Massage and Hairdresser on site, also a cafe. There are many restaurants around and of course the wonderful beach where you can walk for hours. It is only a short drive to Fort Myers Beach and to Naples - there are so many things to see and to enjoy.